This week influential Editor-in-Chief of JAMA Internal Medicine Dr Rita Redberg joins Ray for a wide ranging conversation on all things health. A Professor at the University of California San Francisco and high profile contributor to The Washington Post and New York Times, Rita is also a practising cardiologist who loves to see patients. She says that ‘being a doctor is really a privilege’. Together, Ray and Rita canvas many topics including shared decision making between doctors and patients, the tricky territory of medical device approvals, the controversy surrounding both statins and CT scans, and the implications of not including enough women in clinical trials. Listen to this episode on SoundCloud, iTunes, Stitcher or wherever you listen to your favourite podcasts. 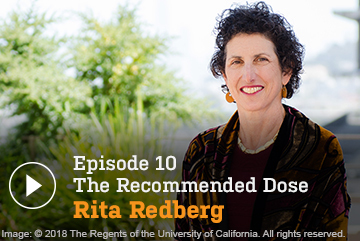 Today on The Dose, a fun, frank and fast-moving conversation with one of the world's most influential medical journal editors, Dr Rita Redberg.Hello, I'm Ray Moynihan, and this is The Recommended Dose. The podcast about the big questions in healthcare, produced by Cochrane Australia and co-published currently by the BMJ. Apart from being editor-in-chief and running the journal called JAMA Internal Medicine for the past decade. Rita Redberg is also a professor at the University of California, San Francisco, and a practicing heart specialist who loves seeing patients. In fact as you'll soon hear just before coming on to do this podcast, she'd seen a patient who was taking 12 different medicines and Rita recommended stopping almost half of them. Born in Brooklyn before it was hip, Rita Redberg like the journal she runs is not shy of controversy. Rita Redberg: We see our role primarily as to provide high quality research that will help clinicians in their practice, as well as research that will talk about health policy and healthcare reform. And I have a great team of editors that have mostly been with me since I started, and we all have the vision to publish high quality research, and research that clinicians can really use. So articles that either tell us what we could do that would help us take better care of patients, or things that we shouldn't do because they won't be helpful for our patients. Ray Moynihan: So it's a combination of the latest science but also kind of big picture analysis of where the system might need reforming. Rita Redberg: That's right because I think part of practicing medicine particularly in the US is very much influenced by the environment that we're practicing in and the direction we're heading. And it's hard not to be aware that with our exponential cost growth it doesn't seem sustainable, and so we're always looking towards ways to improve our use of healthcare resources to keep the healthcare system on a manageable and long term trajectory. Ray Moynihan: A previous guest on this podcast the BMJ Editor-in-Chief Fiona Godlee was very clear that medical journals including the BMJ, the Lancet, have a long history of campaigning on big public health issues. Do you encounter any criticism for the campaigning that you do or do people celebrate it? Rita Redberg: So I guess I don't think of it so much as campaigning which just sounds a little more political than an advocacy role. But we see our role at JAMA Internal Medicine as kind of fuelling the conversations that we think are important to happen. And so for example we like to provide the articles that have the research, the evidence and also the opinions to get people thinking about things particularly in a new way that perhaps they haven't thought of before. Ray Moynihan: Let's talk about some of these issues. If we could talk first about medical devices. Devices don't seem to get the same attention as pharmaceuticals generally, but they're a huge part of the world of medicine aren't they? Rita Redberg: Oh they absolutely are, particularly in my world - I'm a cardiologist, devices are very big in cardiology. They're big an orthopaedic surgery, but in general they're growing in use in medicine, and you're right that they don't get the attention that they should. Ray Moynihan: And am I right in thinking that there's actually a massive number of devices that are regularly recalled because of defects? Is that the case and how do you recall a device that's already in someone's body? Rita Redberg: Well that's a big problem actually. And it's one of the things I like to remind people when we're talking about the quality of evidence needed for device approvals, is that if you do find out a device not just doesn't work but it's actually dangerous, it's not so simple. It's not like a pill where you could just stop taking it. Then you're faced with a terrible choice of either a risky operation to remove a device that's been implanted, or leaving someone for the rest of their life with a device that they're worried is like a ticking time bomb and might cause problems or even kill them. Ray Moynihan: A lot of listeners will be familiar with the pelvic mesh scandal as I'm sure you are Rita. This was a sort of dangerous and one might say unproven device that's caused a lot of harm to a lot of women. Is that an important example for you of the need to improve the regulation of devices, the evaluation of devices? Rita Redberg: Absolutely. I think pelvic mesh is unfortunately just one of many examples. Metal on metal hips, the various ICD Leads, there was just a HeartWare Left Ventricular Assist Device recalled. There are a lot of devices that are being recalled as you noted Ray, and I suspect even more that we don't know about, and that's what I really worry is that our Adverse Event Reporting for devices is so weak and under-powered that we don't even know the extent of the problems that our patients are experiencing with these devices that we are often implanting. Ray Moynihan: How are people supposed to find out what the benefits and harms are of a device when their doctor offers it to them, or when they see it in an ad? I looked at some Cochrane reviews this morning, systematic reviews of the evidence about pelvic mesh. And they show up how weak a lot of the evidence is to support it. But I suspect those Cochrane reviews weren't available back when pelvic mesh was first being promoted heavily. How do we find out the risks and benefits of things? Rita Redberg: Well, ideally you find out from a discussion from your doctor, when your doctor is recommending a device. But unfortunately that's ideally, and it's not happening nearly as often or as regularly as it should be for a lot of reasons, and one of them is just that the evidence is often not available at the time of approval of a device. And so we have devices that have gone into widespread usage without good evidence of benefits or of their harms. Ray Moynihan: One of the things you've launched Rita I think recently is a new series called Sharing Medicine, a new series in JAMA Internal Medicine. This is partly about this new approach in medicine that's being championed now called shared decision making between doctors and patients. You say when you launch that ‘the days of paternalism and expert knows best’ are behind us. Is that right or is that just wishful thinking? Rita Redberg: Well I have to credit Richard Lehman from Oxford who really did a lot of the work and the vision for that series, and worked very closely with Robert Steinbrook one of my editors and colleagues. And it's I think a vision and an expression of where we see the field headed and where we clearly things have changed I think and have moved more toward shared decision making, but we clearly have a lot of ways… a lot of room to go. And I can see it even in my own family's medical care. It's very hard to challenge your doctor. People are very shy about asking, "Well why are you recommending this particular procedure or device?" They don't feel comfortable asking questions often of the doctor. And I've had patients tell me that their doctors have really resented if they have questioned a recommendation, and got upset with them. So we I think have made some progress towards shared decision making, but we have a lot of continued room to move. Ray Moynihan: You said even in your own family it's hard to challenge what the doctor says. Can you give us any insight into that, any examples? Rita Redberg: Well sure, my mother who is in her early 90s now. Her attitude I think appropriately is that she's much more interested in quality of life than in a lot of procedures that might pay off down the road three to five years. And so she had a melanoma removed, and the dermatologist recommended that she have more extensive surgery in case there had been any extension that they didn't catch, but the recuperation period would be several months. And my mother told me quite clearly that she didn't want that. When I talked to the doctor, was very nice and explained to me that the chance of recurrence then could be 10, 20 per cent three to five years down the road. And my mother kind of laughed when I told her that, and said, "I don't know if I'll be here in three to five years, and I definitely don't want that surgery." But she wanted me to talk to the doctor, she didn't feel comfortable challenging the doctor. And then I did talk to her doctor and explained all that, but then she said the next time she went back there again the doctor said, "Well, I'd like to refer you to the surgeon." And again my mother felt uncomfortable challenging the doctor and saying, "No, I don't want to go to the surgeon." I think it's just hard. Doctors are in a position of authority which is the result of training and expertise, but it also makes it I think harder for patients to challenge, and I think it is in this sharing medicine series there is still some remnants of the paternalism and the feeling that you can’t challenge your doctor. Ray Moynihan: So you'd be encouraging everyone listening to do as much challenging as they can. Rita Redberg: Well I think of it as asking questions, but lots of times patients have a scar and I say, "What did you have?" And they say, "Well the doctor said I needed surgery." And they at least don't remember even and just say, "The doctor said I needed it." They don't know why they needed the surgery, they have the surgery. I don't think for a long time there was a tradition of patients asking or of doctors feeling that we had to share the reasons for needing a particular procedure, and I do think that is changing. Ray Moynihan: As the editor of JAMA Internal Medicine you seem to be often in the media spotlight writing high profile pieces, places like the Wall Street Journal, The Washington Post. One of the New York Times piece you had, had the very provocative title We're giving ourselves cancer. Can you tell us briefly what that was about and what sort of reaction it generated? Rita Redberg: Sure, that was about our risk from CT scans and radiation. And that was an op-ed that I wrote with a colleague Rebecca Smith-Bindman that actually came from work that we had published in JAMA Internal Medicine. A study that she had done looking at how for the same CT scan there can be between a 10 and 30 or even up to 50 fold difference in radiation depending on what hospital you went to. And even at the same hospital, on what day of the week, what technician, what settings the machine was at. So incredible difference in the amount of radiation you were getting. And in that same issue of JAMA Internal Medicine we had another article from the National Cancer Institute that said just for the CT scans that were done in one year - that was 2007 - there would be 60,000 excess cancers and 30,000 excess deaths. And that was just one year, and obviously the number of CT scans has only grown every year since then. And so if you extrapolate, that certainly would justify the title of 'We're giving ourselves cancer'. And we noted that some of these CT scans are certainly necessary and could be lifesaving, but a lot of them are actually not necessary and that particularly with the proliferation of CT scans which are an expensive piece and equipment, and the way human nature is – you know once you buy that expensive piece of equipment you tend to use it. And most emergency rooms have now several CT scanners, doctors' offices, every hospital has CT scanners and for the things that I remember when I was training, someone came in with a stomach ache, we kind of did an exam, felt their belly and decided what to do. Now they're going to get a CT scan. And particularly for younger people that is a really significant risk for cancer. Ray Moynihan: So what sort of reaction did you get to that piece? Rita Redberg: It was kind of heartbreaking some of it, because we got a lot of letters from parents whose children had had CT scans and they were very worried about the cancer risk and what had they done to their children, nobody told them about a cancer risk. I don't think of course all the radiologists appreciated it, and they focus on the lifesaving or the beneficial parts of imaging, and we certainly have made great advances in imaging. But I think it's really important to acknowledge that we are overusing CT scans, and that we are not really having a balanced discussion with patients about the benefits and risks of CT scanning before we're recommending it. Ray Moynihan: Another New York Times piece that you co-wrote was called Don't give more patient statins. That was about a change in guidelines which greatly expanded the number of people who should take these cholesterol lowering drugs. What sort of reaction did you get to that piece? Rita Redberg: Well I will say that this was number one most emailed for almost a week I think. I think statins are a big issue for a lot of people, because there are a lot of healthy people whose lives are being made miserable because they were recommended to have statins. And on the belief that this would somehow extend their lives. And it's quite clear, I've read the evidence very carefully, there's minimal to no benefits for most people that are taking statins. The reduction in heart attack is pretty small, maybe one or two in 100 of people that take statins for five years. I don't think there's any extension in mortality, so you're not living any longer. I saw patients this afternoon, and every week in clinic I see people who come in who have been miserable on their statins and are terrified to stop them because they think they'll die if they stop taking their statins. But they come to see me because they want to stop taking statins, but they want to be sure they'll be okay. I think that we have really made cholesterol just too much of an issue. It's not the biggest part of your heart disease risk. And people because of a lot of the guidelines in our discussions, have become too focused on knowing their cholesterol and not focusing on the bigger picture of how to reduce heart disease risk with a healthy diet and regular physical activity and not smoking. So that was the thrust of that op-ed. And it was released right after the guidelines, the updated guidelines which recommended even more healthy people to take statins. Ray Moynihan: Is it important to mention a caveat. I mean, is it your view that the evidence suggests that, if you already have some sort of existing heart disease then a statin could give you some kind of benefit. Is that your view? Rita Redberg: Correct. We were talking about primary prevention in that op-ed, we were not challenging the evidence for secondary prevention. So if you have heart disease, if you've had a heart attack or have angina, then there clearly is benefit for statins. But most of the people that are taking statins are healthy people that are trying to avoid a first heart attack, and that's where I think the evidence just does not show that the benefits outweigh all of the adverse effects. Ray Moynihan: You mentioned the work that you do in your clinic. You mentioned seeing patients this afternoon in fact. I'm presuming that you're one of the doctors that practice de-prescribing. It's a funny time isn't it, in the world we live in now, in the world of healthcare where these new words are emerging like ‘de-prescribing’. Is that going to be a hard skill for a lot of doctors to learn how to de-prescribe? Rita Redberg: Well I think anytime you have a change in culture it's a little hard, but I don't think it's actually that hard. I mean we've had well the Beers Criteria and other criteria for a long time. But a lot of it is just common sense. But I have to say I think once you start doing it, the feedback I get from patients who I've stopped some of their medications is so positive, that it's not really very hard because people feel much better when you can take them off the medications that they really don't need. The average person particularly as we get older, is now on like five to seven medications that was never true 20 years ago. And a lot of them are things that people don't need, aren't making them feel better, and there is a synergistic effect being on so many medications. But you're right, the last patient I saw, she came in and she said she's on too many medications. She says she wants a holistic approach, but when I talked to her, clearly her idea of holistic was just being on less medications. And I stopped five of her list of 12, and told her we'd see how this goes. And next time I saw her maybe we could stop one or two more and talked again about diet and lifestyle. And she had heart disease but she still didn't need as many medications as she had been put on. Ray Moynihan: You can take away an unneeded drug, but I think taking away an unneeded diagnosis is going to be a lot more complicated. There are companies offering to screen the genomes of healthy people in San Diego, in Sydney and in no doubt in many other countries and cities around the world - presumably to detect the early signs of disease and thus prevent it. What's your view about this new wave of genomic tests that are being promoted to the healthy? Rita Redberg: Well Ray I think you alluded to the concerns. Maybe Gil Welch said it, but we're getting to like there's no such thing as a healthy person, just someone who hasn't had enough tests. I feel like we keep wanting to open Pandora's Box, and we know what happens when you open Pandora's box and it's not good. Ray Moynihan: What does happen? Rita Redberg: Bad evil humors come out and they won't go back in. And I think that's what happens. You know, I tell people if you're feeling well it's very hard to have a test that's going to improve on that. Let 'well enough' alone. Work on eating whole foods and a healthy diet and getting regular exercise, and spending time with people you love. And you don't need a test, because that's not going to help you live longer or feel better. And it's to find sort of early disease that has ... First of all, we don't even know how reliable those genetic tests are, so a lot of the testing has been shown if you send the same specimen to three different labs, you get three totally different interpretations, so that's a problem. But then even if you have a reliable interpretation, to be told you have a 30% chance of getting Alzheimer's, I mean how is that helpful. It's a 30% chance you don't know what to do, and I would say your best strategy is to live a healthy lifestyle, and do the best you can and then forget about it. Ray Moynihan: A lot of this evidence about unnecessary care is actually being built in part through the series you launched a while back called Less is More. We've talked about some of these issues already, but do you think things are changing, do you think that your 'Less is More' series, things like Choosing Wisely, other initiatives around the world. Do you think there is a growing appreciation of this or are things getting worse? Rita Redberg: Well, I think there is a growing appreciation that we overuse procedures, and that there are harms. Our real impetus to start the 'Less is More' series was because we thought that there was insufficient realisation and discussion, that there are harms to some medical procedures. And if they have no known benefit, then all you're left with is the harms. I think we have made some progress, but I think partly due to the culture of medicine and our belief for so long that early detection was better, although the more I look at it the less I believe that. And I have to say particularly in the US and other countries that have fee for service medicine – you know, when we get paid to do things, there's an incentive to do things. Ray Moynihan: Rita you have many interests, one of them is women's health. A recent article that you were part of was called The Risk of Remaining Silent: Addressing the Current Threats to Women's Health. Very much about the US, Trump administration, and what seemed like an attack on women's access to contraception and other services. And I think there was a call in that article for sort of greater advocacy or great speaking out on the part of clinicians and public health experts, is that right? Rita Redberg: That's correct. That was really led by my colleague at the Institute for ... the director of the Institute for Health Policy Studies Claire Brindis and others were very concerned that there is a loss of women's rights and women's health in this country in the last year and two. Ray Moynihan: What role do you think public health doctors, the medical world can play in that? Rita Redberg: Well in a way, in that case we thought writing an editorial and raising our voices, and saying that we see the consequences of what happens to women patients when they don't have access to healthcare, they don't have access to needed healthcare, they don't have choices about their healthcare. And the other thing I've been very active about is trying to advocate that we have to have sufficient numbers of women in clinical trials, so that where we test drugs and devices, for many years we were testing drugs and devices on mostly male populations, mostly white male populations. And harms and benefits which we've been talking about a lot you and I are different for many things, for men and women. So it's just not sufficient to have 90% men in a trial and then say, and this will apply to women too, because it may not. But I think as a physician I really understand and can see that risks and benefits do differ for men and women, and then can more effectively advocate to include women in sufficient numbers in clinical trials. Ray Moynihan: Before we close Rita, I'd like to shift if we can a little to a bit more of a discussion about you, your personal history. Can you tell us a little bit about your family background, where you came from, how that might have shaped your worldview? I think I’m right in saying you didn't come from the medical establishment did you? Rita Redberg: [Laughs] I didn't come from the medical establishment, no. Actually neither of my parents graduated from high school. My father got a high school equivalency diploma, my mother did not. So I was the first one in my family to go to college and then on to medical school. And I did it with financial aid and scholarship. I did not have financial support from my parents because they had fairly modest means. So I would say that the idea of avoiding waste was instilled in me very early in life, just because it wasn't a financial option for us. I grew up in Brooklyn as I say before it was hip. And the part of Brooklyn that I grew up in is still not very hip [laughs]. But I was very fortunate to go to Cornell University on a scholarship, and then to attend the University of Pennsylvania Medical School, where I ran into John Eisenberg, which was incredibly lucky. He at that time was the Chief of General Internal Medicine, and I thought I wanted to be a general internist when I entered, so I was working with him. And he was very much into sort of the big picture and challenging the house staff at that time on their use of testing, and sort of asking questions, and saying, "Did you really need this test? And did it lead to a change in patient management?" And he discovered it was actually very hard to change the house staff behaviour, but it made a big impression on me and really did lead me because I was just a second year medical student at that time, to start questioning things that I had taken for granted - was that if I was taught to order a certain thing every day, that it was for a good reason. And I realize that there are a lot of things that have become part of medical culture that don't have a good or a strong evidence base. And so that really got me interested in health policy. I got a Thouron Fellowship from the University of Pennsylvania, and studied for a year at the London School of Economics doing Health Policy in between my third and fourth year of medical school. And that again, seeing the National Health Service and a system where there is universal coverage, everyone has access to healthcare. And Great Britain spends much less than the United States does was very interesting and very eye opening for me. Ray Moynihan: Yes, I had the good fortune of studying in the US and looking at the US healthcare system that spends almost twice as much as many other countries, but doesn't get the same benefits. Rita Redberg: Well exactly. I think you do much better in Australia. Everyone spends less than we do, but I think the coverage and the value of spending is much greater in Australia, in a lot of Western European countries than in the US. Ray Moynihan: So you trained as a doctor and you clearly love medicine. I mean the fact that you're still practicing as a cardiologist today, you could easily just devote all your time to the journal and other work. But you must have a real passion for actually being there, in the room talking to people about their health issues. Rita Redberg: I do, I love seeing patients. And I feel like being a doctor really is a privilege. Patients still trust their doctor. I feel like I can help people feel better, it's very rewarding to me when I can reassure somebody or help them with an illness or concern. I think it's a great privilege to be a doctor, and I don't intend to stop practicing. Ray Moynihan: Outside of your work Rita, I think you like to get outside, you like to get outdoors into the wild, into the world. And like many listeners including the French president, you're worried that there's no planet B.
Rita Redberg: [Laughs] That's true actually, my husband and I a few weeks ago did what was called the Climate ride in California. So we rode 320 miles from northern California to San Francisco which was very beautiful, but it was a fundraiser for a climate change awareness, because we are greatly concerned that we are not leaving behind a great world and a great future for the next generations, for our children and their children. I just flew back from Switzerland actually. Fi Godlee and I were at the same conference, and I felt like coming over Hudson Bay and the Arctic it looked to me like - not that I'm an expert in it - but that there was just a lot less glaciers and a lot less ice. I think it's very hard to deny that there is clearly climate change and that we really need to take care of our planet so that it's here. Ray Moynihan: Just to close Rita Redberg, there was a beautiful short piece from you a couple of years ago in your journal, suggesting that you advice some of your patients to try and forget about spending money on an unnecessary cardiac test, and instead spend it on a sauna or a massage. It reminds me of a book by Cambridge philosopher Jacob Stegenga that I'm just reading at the moment, it's just come out. It's advocating a radical shift to a much more gentle form of medicine. Is that possible or is it just a wild dream? Rita Redberg: I like to think it's possible. If you think of medicine, a lot of what we do is trying to help people feel better, and that's where I think things like sauna and massage come in. You look at for example all the treatments for back pain and very few of them have really been shown to be effective in any high quality clinical trial. But so many people feel better after a sauna or a massage. Their pains go away, they feel less stressed. And so it makes a lot of sense to me that we should be incorporating a wider range of approaches to helping people feel better, which I do think is part of the role of being a doctor. Particularly older patients, I think would feel a lot better with saunas, massages, those kind of relaxing things than they would with you know, a cardiac defibrillator that I'm going to put in someone who has very little chance of benefit from it. And it's going to be a lot cheaper just to have that sauna or a massage. And we've actually published papers showing the health benefits of saunas, so I think it's very evidence based. Ray Moynihan: I think that massage has been around since Hippocrates. I mean it was part of mainstream medicine back then wasn't it? Rita Redberg: [Laughs] I think you're right, and I think they were on to something. Ray Moynihan: Rita Redberg, thank you so much for your time, it's been a pleasure. Rita Redberg: Thank you so much Ray, it was a pleasure. Ray Moynihan: Editor-in-chief of JAMA Internal Medicine, Rita Redberg on The Recommended Dose. Many thanks to Shauna Hurley and Cochrane Australia for production, to Jan Muths for editing and Brian Coe for the cross to San Francisco.